Or, as its makers hoped the region would soon be known, the Hollywood of the Northwest. Chief of Police (and director) W. S. Van Dyke gets the drop on the bad guys. 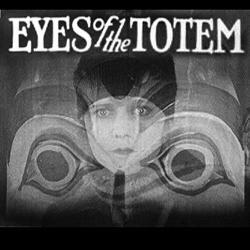 A feature-length film made in 1926 with top-of-the-line production values, “Eyes of the Totem” is not only a fascinating time capsule of familiar landmarks and locations as they appeared 93 years ago, it’s a milestone in local and even Hollywood history—and a rip-roaring tale of mystery, murder and intrigue to boot. One of three feature films produced by local promoter H. C. Weaver in his attempt to establish Tacoma as a center of film production that would soon rival Hollywood, “Eyes of the Totem” was thought lost until 2014, when it was rediscovered in the vaults of New York’s Museum of Modern Art (sadly, the other two films—“Hearts and Fists” and “Heart of the Yukon”—are still missing). 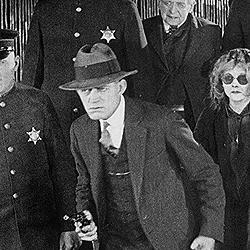 Restored, given a new musical score and “re-debuted” to enthusiastic audiences at Tacoma’s Rialto Theater in 2015, “Eyes of the Totem” has caught the attention of critics and film historians alike as a previously unknown work by W. S. Van Dyke, director of the “Thin Man” series and other highly successful films of the 1930’s. Here, Van Dyke not only directs, he plays a major role as Tacoma’s chief of police. Another major role that will be of particular interest to residents of Lakewood: Thornewood Castle, expertly portraying itself as the home of the lead characters. Thanks to the Tacoma Historical Society—fiscal agent and keeper of the film—the Lakewood Historical Society has been given the opportunity to present this free showing of “Eyes of the Totem” to the general public at the Lakewood Library (6300 Wildaire Road SW) on Tuesday, April 23 at 6:00 pm. Don’t miss it. No matter which you love more—local history or the movies—you’re bound to be captivated by this unique combination of the two.